Since her retirement from the civil service, Mrs. Akintunde-Ighodalo has become a prominent spokeswoman and facilitator, much sought after, as earlier indicated, as a speaker, a chairperson, or a patron. She feels it is her duty to accept as many of these invitations as possible, because they provide fora for sustaining her contemporaries and encouraging young women and men. As we shall see in the next chapter, her interests bridge the gap between activist and scholar. 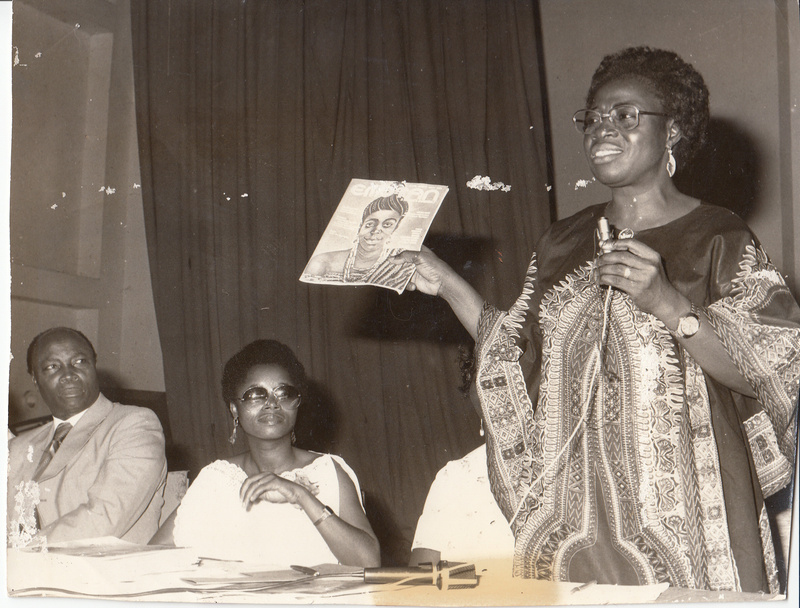 From the beginning, she has supported academic efforts to establish Women’s Studies in Nigeria. FROM: Paper presented at Dartmouth College and York University/UNESCO/SSHRCC Nigerian Hinterland Project Workshop: “Atlantic Crossings: Women’s Voices, Women’s Stories from the Caribbean and the Nigerian Hinterland, May 18- 20, 2001. Sitting L-R: Chief N.K. Adamolekun, first Nigerian Registrar at U.I. (Adenle’s Brother); Tola Adenle; partially-hidden, now Retired High Court Justice Mrs. Titi Mabogunje and Chief Fola Akintunde-Ighodalo. [Auntie Ighodalo was a thoroughbred upcountry girl: brilliant, articulate, very sure of herself, very hard-working and a visionary in the true sense of the word. Back in the mid-70s, she saw the problems that densely populated Agbowo not far from upper & upper-middle class neighborhoods of Bodija - old and new - and Agodi GRA. She set about doing something about preventing a fire that was not far ahead, bringing young kids from the neighborhood to her house for informal and disciplinary training and offering other little help. Even though Auntie rose to become a Permanent Secretary, the first Nigerian woman to rise to that level, she did not amass wealth but of the little she earned, she gave. Auntie was really "old school" which made a lot of people see her as "too strict" but for those who really got to her, she merely taught what she had learnt in an earlier era both at her bucolic Oke-Igbo hometown, then at Nigeria's premier girls' school, Queen's College and abroad. By the way, her Oke-Igbo hometown also produced another great Nigerian, linguist and story teller, the Late D.O. Fagunwa who wrote the Yoruba classics: Ogboju Ode ninu Igbo Irunmale (translated by Soyinka: Forest of a thousand demons); Ireke Onibudo, etcetera. Throughout the years I wrote to a "mythical" Auntie Fola, dear, briefly at the Sketch at Ibadan, Emotan, The Comet/The Nation, and subsequently to a "mythical niece, Yewande", I did not disclose who the auntie was and was pleasantly surprised a few years ago when I came across the paper above by Ms. Denzer. I have since out-ted myself since I started this Blog. The trans-generational conversation would continue in, first, The Nation on Sunday from 2002 to 2010 with a “niece”, Yewande, of whom “Auntie Fola would have concurred on most issues. Yewande was as confident as “Auntie Fola”, having no qualms about pursuing her goals while being very devoted to her young family. As in all things, that chapter was gently closed with my “letters to my niece, the writing life and saying goodbye” on December 26, 2010 in The Nation on Sunday an essay that was presented here on July 7 last year: http://emotanafricana.com/2011/07/07/a-letter-to-my-niece-the-writing-life-saying-%E2%80%98goodbye%E2%80%99/ as I wanted to do what I’m doing right now which I believe should not only bring the few public writings I have done together in a format that fit the present age but should reach a wider audience. I also intend to continue to contribute comments to happenings along the same old lines that I’ve always written. Below is a short tribute in The Nation on the fifth anniversary of her translation. TOLA. The 5th Anniversary of the translation of Nigeria’s first female permanent secretary, Chief Folayegbe Akintunde-Ighodalo was marked a couple of weeks ago. After a thanksgiving service at the All Saints Church, Jericho, Ibadan, the children have started a befitting foundation aimed at “promoting high standards, positive values, excellent work ethics, integrity and good principles in the society,” in her name. It will benefit students in her native Oke-Igbo, Ondo State; Queen’s College (QC) and Methodist Girls’ High School (MGHS) where she taught before joining the Western Region civil service. To “set professional excellence in the civil service within the five states in the defunct Western State” where she worked till her retirement, four awards will be given every year “for Best Permanent Secretary in Ekiti, Ogun, Ondo, Osun, and Oyo states, with a cash prize of N500,000.00 each. The Best Female Student at Oke Igbo Grammar School will receive N100,000.00 annually; the Best Graduating Student at QC will be awarded a cash gift of N100,000 and the Best Graduating Student at MGHS will be awarded a cash gift of N100,000. The cash awards will go towards their university education. What a grand statement by kids of Auntie Fola, a woman who surpassed even the high standards of her era! She lived and fought not just for herself and her own but for the most downtrodden in society. She saw the problems that the huge underclass that Nigeria was breeding right in her backyard of densely-populated Agbowo, Ibadan and in her usual quiet way, set about doing something about wandering and aimless kids. Like her alma mater, QC, she did “pass on the torch” to her kids, Tolu, also an old QC grad, [Pastor] Ituah and Asue, no slouches, either. And to think all she got for her pioneering role and her tremendous personal work to improve the lives of the less-fortunate was the lowest Nigerian government national honor, OON, is not just a slap on the face of Nigerian womanhood but a travesty. There are CFRs, several steps higher than her OON who got their awards while actively engaged – now and in the past – in looting at civil service employments. Do Nigerian government “honors” mean much? The Nation on Sunday February 28, 2010.